1./ 4 small red Mullets, nicely cleaned, not a single bones. It requires to prepare the fish your self which takes a bit of time as with a pincer you have to take not only the middle bone but also feel all the small remaining bones and take them out one by one. 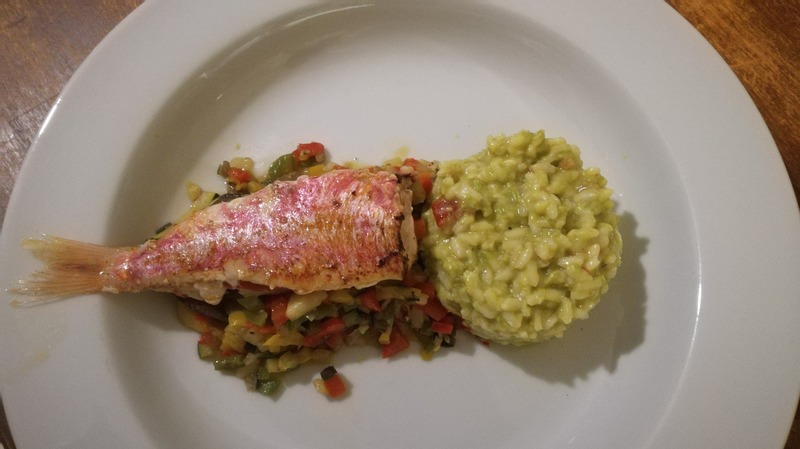 2./ Risotto, 1 cup of Risotto rice (Carnaroli or Arborio), preserved tomatoes, green peas, 1 cup of white wine, fish stock, Parmesan, butter,pepper and salt. Quit some cold butter. 3./ Ratatouille: for this specific dish I want a rather “dry” ratatouille with out tomato that would make it too moist and liquidy, cut in very small pieces. Onion, garlic, zucchini, 1 green, 1 red, 1 yellow belle pepper and a small aubergine. Preparation: clean the fish, cut head, take out intestines, fillet on both sides along the spine, leave fish tail on, just cut spine prior end of fish tail. You have now 2 fillets attached to each other by the tail. Take out all bones with a fish plier. You should not have a single bone left. Cover and put a side in the fridge. Just prior serving: cover bottom with baking paper and oil. This will prevent you from over cooking and burn the nice red colour of the skin. Once one side cooked- turn and take of the heat. Let it slowly cook whilst dressing your plate with the ratatouille etc. Ones dressed your fish will be perfect and not over cooked. Ratatouille: this is a “short” version of the original Nicois ratatouille which is with tomato, larger cuts of vegetables and soft cooked. Onion, red and yellow bell pepper, zucchini and aubergine, piment d’espelette, garlic. Onion and bell peppers, aubergine, zucchini (keep skin of all vegetable with exception of onion and garlic) cut all very fine and keep all separate. Fried individually as to keep cooking point of each vegetable. Zucchini and bell peppers should remain “aldente” (crispy). When reheating prior serving mix all together. Take a nice risotto rice such as Carneroli or Arborio, Green peas, and preserved tomatoes. Cook the peas for 10 min and cool, them of in ice water for 5 min. cooling the off immediately will save the nice green colour. Cut lemon and tomatoes as small as possible but do not mash and keep aside. Mix until a smooth mash the peas. Cut shallot same size as rice coral, grain the cheese and keep aside. Warm a bit of oil in a pan and “melt” on a soft fire the shallots. Keep them white do not fry. Add rice and simmer until transparent for a couple of minutes. Add wine and let evaporate the alcohol. Start to add the stock little by little until aldente. Take of the fire, ad quit some butter and let rest. Add parmesan in to rise. Serve nicely presented on heated plates. You may want to use forms for the presentation. The “spiff bit”: ad a bit of small cut preserved lemon in the risotto: this definitely ads another dimension to the rice and matches very well with the fish.